Don't let the name fool you - OptionsXpress is much more than just options. With a standard OptionsXpress account, you are able to trade a full range of different financial instruments through one account - stocks, options, futures, bonds or ETFs. While options and futures are geared towards more experienced investors, novice investors and traders can greatly enhance their investment portfolios by investing in bonds and/or ETFs. If you are looking to trade options, then you are not likely to find a better place than OptionsXpress. Even if you are NOT looking to trade options, OptionsXpress is still a great choice. According to their web site, OptionsXpress was voted best online broker by Barron's in four out of the last five years. Given the amount of competition in the industry, this is a fact that should not be overlooked. If you are worried about the financial standing of OptionsXpress, don't be - they are a well-capitalized, publicly traded company. OptionsXpress Holdings, Inc. trades on the Nasdaq and currently has a market cap of over $1 billion dollars. 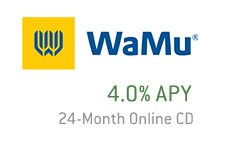 They aren't going anywhere, and they certainly aren't going to vanish with your money overnight. All of their accounts are protected by the SIPC. OptionsXpress currently has hundreds of thousands of happy customers. OptionsXpress has a lightning fast account opening process. They have clearly made a great effort to streamline this process (which can be quite frustrating) as much as possible. 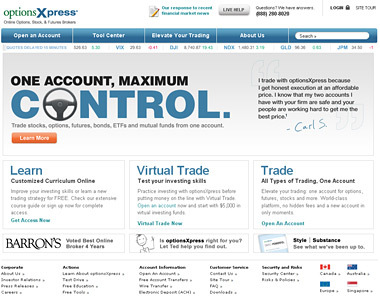 OptionsXpress also allows you to "test-drive" an account if you aren't quite sold on their company. They will give you a 10-day free trial, which will allow you to poke around their software package to see if you like it. If you do, then you can easily begin the process of upgrading to a standard account. OptionsXpress is currently offering free account transfers. This means that the company will reimburse you for all of the costs involved in moving your account from another brokerage to OptionsXpress. This is a value-added bonus, and not all brokers offer this. The company also offers free access to 18 different trading tools, free IRAs and free real-time streaming quotes. One last thing - the customer service at OptionsXpress is tremendous. 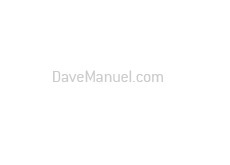 From my dealings with them, they have always been knowledgeable, kind and courteous. They have customer service staff available until 10 pm every night. In addition, they are even available for service on Saturdays. Saturdays! Not too much brokers offer that.